Pictured above: Not the fabled game-winner chronicled below, but representative. Get ’em, Bren! Those who know me best know that I’m an emotional sort, so it will come as no surprise to them that I choked up at Bren’s baseball game last Thursday. His team was playing for a chance at the consolation finals (a shot at third place in the league), and fell behind by seven or eight runs in the first inning. They kept pace after that with scrappy play, including a five-run inning that started on the third strike of the third out, when the opposing catcher lost his handle on the pitch and Bren’s teammate scampered to first. But they were still down by eight when they came up to bat in the bottom of the sixth and final inning. 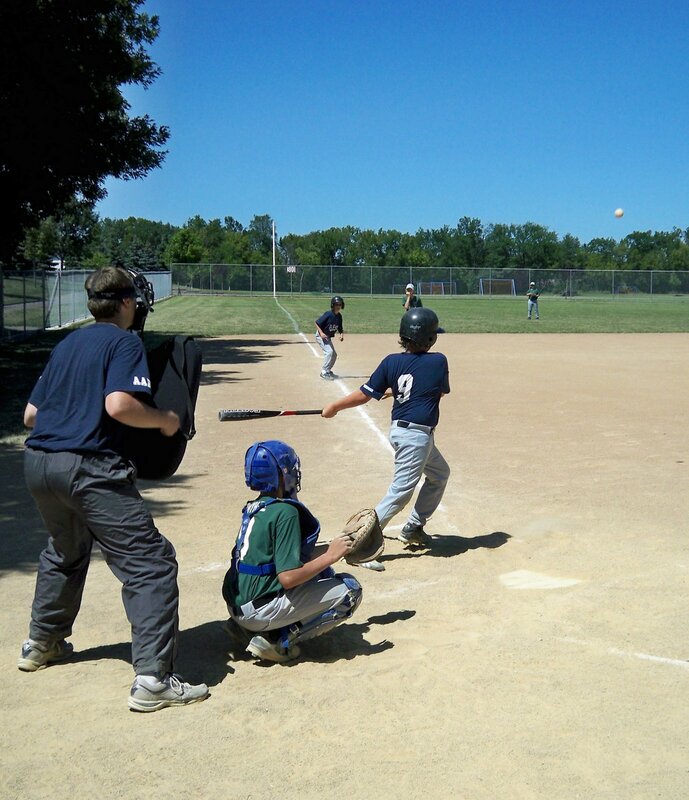 Slowly, steadily, they chipped away — now a hit, now a walk, now stealing home on a wild pitch — so when Brendan came up to bat, the score was tied with two outs and the winning run on third. Brendan had a hit earlier in the game, and his coach had mentioned he had a great round of batting practice before the game. Even so, my heart was in my throat. Those who know me best also know that I was a poor athlete, and a particularly ungifted hitter in three short years of baseball. I had not wanted to bat in such situations, and I wasn’t sure I wanted it for him. The first pitch sailed high over his head and into the backstop; the catcher scrambled, and the third-base coach sagely held the runner against the boy’s better judgment. The second pitch slipped neatly down the middle and into the catcher’s glove as Brendan watched it pass: STRIKE! Maybe there was another pitch or two in there somewhere; maybe not. The next pitch I actually remember met the bat with a metallic PING! and flew high into the air. Bren started toward first with all his father’s speed, watching the ball as it fell down, down. (Just run! my heart shrieked.) The runner at third tagged up and headed home. There was a relatively narrow expanse of grass between the infielders and the out, and Bren’s towering fly ball fell exactly there, behind the backpedaling shortstop, and in front of the racing left- and center-fielders. When it bounced on the grass, Bren grinned, spread his arms wide like wings, and stomped firmly on first base as his teammate crossed the plate — the walkoff RBI; the winning run. His teammates mobbed him, shouting their joy. I grinned, laughed, cried. He works hard at being a good ballplayer, and he has accomplished so much that I never did. They won their game Saturday, as well, to earn third-place trophies all around. Congratulations, Bren and team, for a great season! I am the same way: always expecting the happy ending in books but the disappointment in real life. I'm glad things swung the right way for Bren. Me, too — and nice pun, Coach! Awesome! Tell him congrats from us!